Nakagawa is the leader in converting and distribution of recording papers. We manufacture and sell all types of recording paper used for cash register receipts, office automation, medical diagnostic equipment, and digital graphics. Nakagawa Manufacturing (USA), Inc. is a subsidiary of Nakagawa Mfg. Co., Ltd. of Saitama, Japan. We are a pioneer in the processing of specialty paper such as graphical recording paper, facsimile paper rolls, mini-printer rolls, and printer paper. We strive to put our wide-ranging expertise at our customers' disposal as a supplier of application-specific processed paper, a provider of solutions for complex customer requirements, or an innovator in paper product design and manufacture capable of opening up new markets. 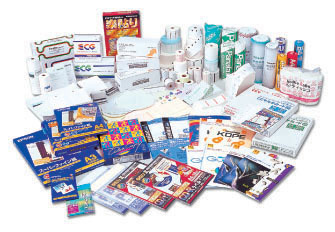 Our world-class converting facilities and technical expertise allow us to meet almost any paper product requirement. Nakagawa's strength lies primarily in our ability to respond quickly to requests for new products from instrument manufacturers. This has helped us become a major supplier of specialty paper products to OEM's (Original Equipment Manufacturers) of printers and recording devices. We have strong business relationships with paper mills the world over, and a wealth of expertise in raw materials. Together with our advanced processing and printing technologies, we develop, design, and convert specialty paper products for use in almost any application. By implementing customers' suggestions and development requests, Nakagawa brings products to market that meet highly specialized requirements. During the process, we have accumulated valuable process expertise and intellectual property for future solutions. When we analyze customers' needs and requirements, we always consider which base paper or materials would be best suited for the job, and what would be the optimal solution for processing, printing, and finishing them. Customers have come to expect innovative responses to their development needs.